We care about your employees health as much as you do. That’s why we provide various immunizations throughout the year to keep you and your employees in exceptional shape. We offer immunizations to protect against hepatitis A and B, Pneumonia, and tetanus. We also provide tuberculosis skin-testing using CDC guidelines to offer you as much protection as possible from avoidable diseases. Protect against tetanus, diphtheria, and pertussis with this CDC recommended immunization. Your liver needs protection from HAV and HBV and we’ve got both immunizations to keep you covered. We’ve got the CDC recommended vaccines for travel, so you can stay healthy overseas. 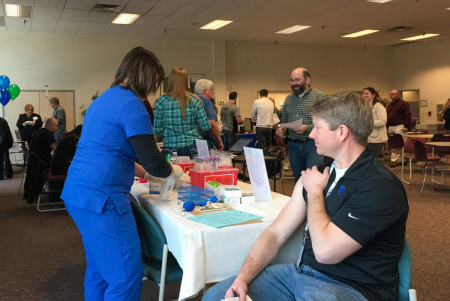 Contribute to your employee’s health by adding immunizations to any health fair package for an affordable rate! And if you’re traveling, just be sure to give us a call so we can check on getting you the correct immunizations. Vitamin B12 is a water-soluble vitamin that benefits our bodies in a multitude of ways. Adults need 2.4 micrograms of B12 each day, but many studies show that they aren’t getting it. Even with the healthiest of diets, you may be missing out on the full dose you need!